Welcome to my videos page. I film many of my pencil pet portraits, framed, unframed and in progress so my clients can see the portraits in a little more detail. I find it is much more three dimensional than the final scans. click the tabs for more content and info about each portrait. I hope you enjoy the videos. These three drawings were commission by a client in the USA. The first is an 18 x 14 drawing of Violet and Gil, both English Setters, the second is an 8 x 10 drawing of a Cocker Spaniel called Charlie and the third is an 8 x 10 drawing of English Setter called Rooney. They were all hand drawn by myself - Melanie Phillips. Melanie : Here are my latest three portraits commissioned by the same client for their family. If I come in slightly closer this is an 18 x 14 pencil portrait of Gill and Violet and I absolutely loved drawing both of these dogs. They have such expressive eyes and all the curls and the little spots on their faces - it's just absolutely fantastic and so I really enjoyed drawing them. Moving over very slowly to Charlie and Charlie is a 10 x 8 pencil drawing and again I really loved drawing Charlie, he's got such expressive eyes and his curls in his ears - there's lots of detail so that was fantastic to draw, and then finally to Rooney another 10 x 8 pencil drawing and he looks such a happy chappy. He's got such an expressive face and again fantastic to draw. So all three of them are going to be packed up and hopefully heading off to very happy recipients this Christmas I hope you enjoyed the video. This is an 8 x 7 drawing of a beautiful cat called Padstow. Sadly Padstow passed away at a very young age and so this portrait will serve as a wonderful memory for all of the family. The video is about a 16 x 12 pencil drawing of a very special dogs called Mike who passed away very unexpectedly. The portrait will serve as a heartfelt memory for Barry and all of his family. Click on the photo tab to see a photo of Barry, in his home in Australia, with the framed drawing. Melanie : This is my latest pencil portrait and it's a 16 x 12 drawing and I’ve added my pencils into show scale. This is a lovely dog called Mike and the first drawing of Mike was when he was a puppy and the other drawing is Mike when he was slightly older as an adult. I think it's a lovely way to show two stages of a dog's life in one portrait and it's going to be heading off to Australia this week - I hope you like it. Paula had recently lost her beautiful dog called Teasel and emailed to ask if I would create a portrait for her. I drew Teasel at 10 x 8 size and you can see a photo of Paula and Teasel's portrait in my testimonials section of my website. Have a look also in the final scan tab to see a larger version of the drawing. 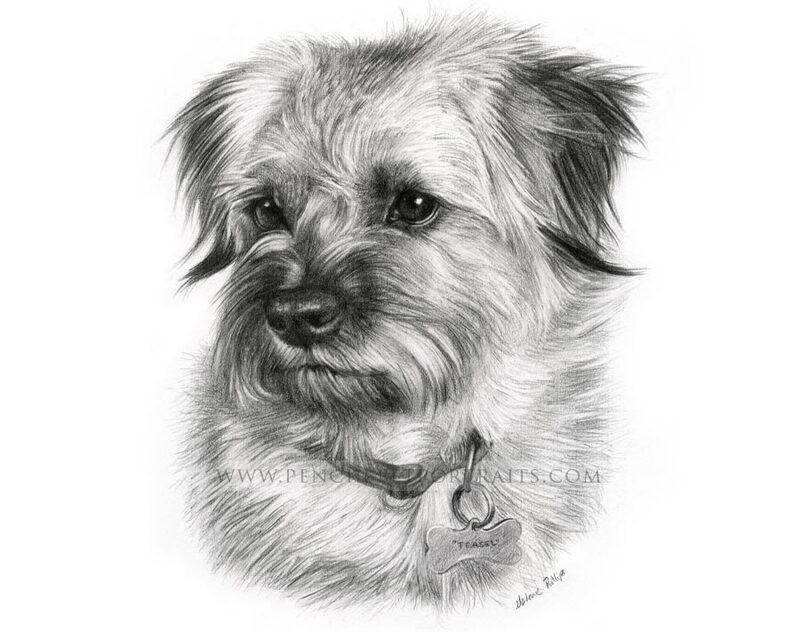 Caroline commissioned me to draw a portrait of her mums Tibetan Terrier HollIe who passed away at the age of 14. I was so excited to draw Hollie as I have my own Tibetan Terrier and feel I know the breed pretty well. I hope you like it! Melanie : This is my most recent portrait of my drawing board it's a lovely dog called Hollie and she's a Tibetan Terrier. We've got a Tibetan Terrier so it was really nice to be able to draw another little character- they've got so much character these dogs and I love drawing the long fur. If i zoom in slightly closer you should be able to see a little more detail. The portrait is a 12 by 10 pencil drawing and it's going to be packed up and sent off today to the client. I hope that the recipient is thrilled- thank you for watching and I'll have another video along shortly. See what was on my desk and find out about my drawings! Melanie : My neme is Melanie and I'm professional pet portrait artist, drawing dogs cats and horses for commission. I've got three pieces of artwork on my desk ready to send clients and I thought this would be a good opportunity to take some video for clients to be able to see my work a little better. So onl the right hand side is Teasel and this is a 12 by 10 pencil drawing and on the left is Hollie and she's also a 12 by 10 pencil drawing. The montage in the centre is of Casanova and it's a 24 by 18 . The montages are fantastic because clients can have a large central study and then different studies around the outside. So in this case the horse and rider doing different things. The montage is going to be framed using the Honey Knots frame and we've also got an engraved plaque to go on it. You should be able to see that in my galleryvery soon. I hope you enjoyed viewing my work and seeing where I work. If you would like me to draw your cat, dog or horse you're more than welcome to contact me any time.